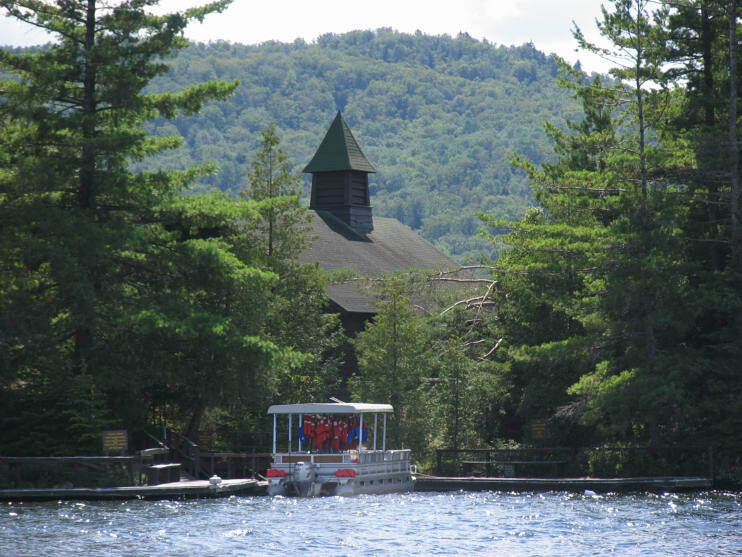 Island Chapel is an interdenominational chapel offering a worshipful atmosphere throughout the summer, located on a very small island at the south end of Upper Saranac, easily accessible by boat from Fish Creek, or by driving to Indian Carry off Route 3 at Dock Road. Inspirational speakers conduct the worship service. Each Sunday members of the congregation are invited to sing in an impromptu choir. Worshipping at the island has been a unique experience since the mid-1800s. The Chapel, which is on its own island, blends well into the Adirondack landscape nestled amongst tall pines, overlooking majestic mountain peaks and surrounded by sparkling water. Island Chapel opens its summer season Sunday June 28 and continues through September 6, 2009. Island Chapel is located at the south end of Upper Saranac Lake. Boat transportation is available every Sunday morning. The Chapel Bound pontoon boat leaves from Indian Carry off Rt. 3 at the end of Old Dock Road where you will find ample parking for your car. The first boat trip leaves for the picturesque ride at 10:15 AM and again at 10:35 AM. 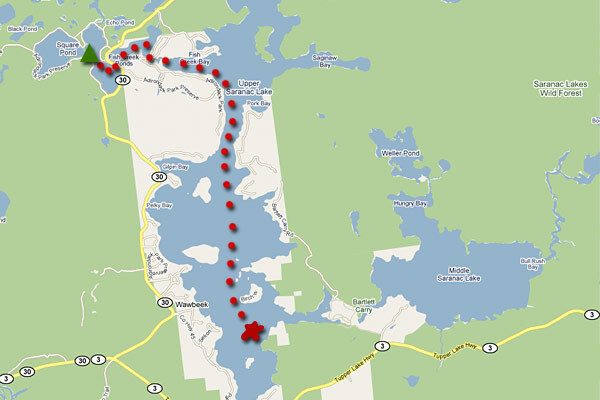 You may bring your own boat if you happen to be on Upper Saranac Lake . The boat driver drops their passengers off at the Chapel dock, and then anchors off shore. A shuttle transports the driver back to the dock. The service begins at 11 AM. After the service, the Chapel Bound will return you to the dock at Indian Carry. Island Chapel opens its summer season Sunday, June 29th. 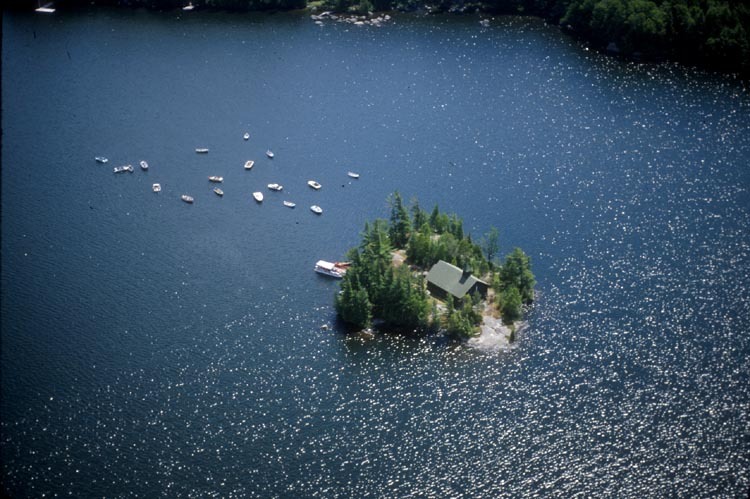 Island Chapel is located at the South end of Upper Saranac Lake which is accessible by boat via the Fish Creek Ponds. Boat transportation is available every Sunday morning. The Chapel Bound pontoon boat leaves from Indian Carry off Route 3 at Dock Road. The first boat leaves for this picturesque boat ride at 10:15 AM. You may bring your own boat. The boat driver drops their passengers off at the dock, and then anchors off shore. A shuttle person transports the driver back to the dock. Island Chapel is interdenominational, offering a worship atmosphere throughout the summer. Inspirational speakers conduct the 11 am worship service. Each Sunday members of the congregation are invited to sing in an impromptu choir. Worshipping at the Island Chapel has been a unique experience since the mid 1800's. The Chapel blends well into the Adirondack landscape nestled amongst tall pines, overlooking awesome mountain peaks and surrounded by sparkling water.